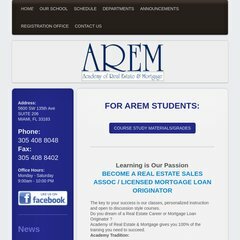 Topics: Schedule, Real Estate Pre-license, Real Estate Post-license, Mortgage Broker, Continuing Education, and Download Registration Form. On average 6.00 pages are viewed each, by the estimated 5 daily visitors. The programming language environment is PHP/4.4.9. There are 2 Nameservers, ns57.1and1.com, and ns58.1and1.com. It is hosted by 1 1 Internet Inc. Pennsylvania, using Apache web server. PING www. (74.208.28.103) 56(84) bytes of data. A ping speed test response, is timed at 0.796 ms.